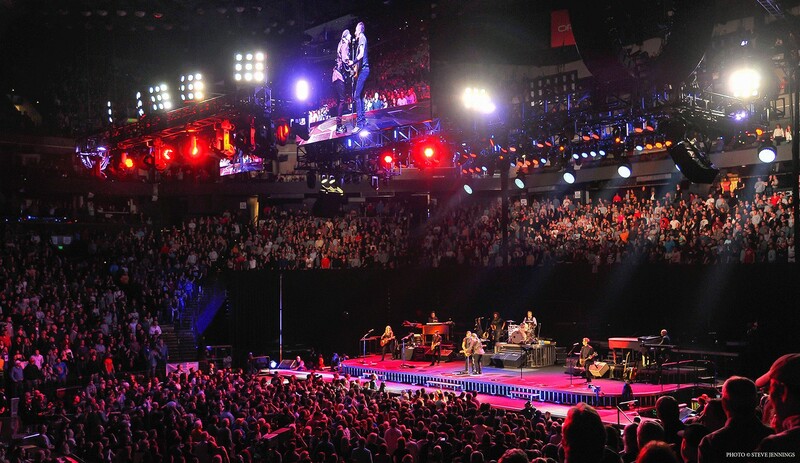 Martin by HARMAN lighting fixtures recently shared the stage with Bruce Springsteen and the E Street Band during the U.S. leg of The River Tour 2016. The tour kicked off Jan. 16 in Pittsburgh and visited 35 cities by the time it wrapped up at Brooklyn’s Barclays Center on April 25. The tour coincides with the release of an archival box set, “The Ties That Bind: The River Collection,” from the hit 1980s’ album “The River” and each show features an in-sequence, complete performance of the album’s 20 songs. Jeff Ravitz, longtime lighting designer for Bruce Springsteen and the E Street Band, specifically selected MAC Viper Profiles and MAC Aura fixtures to serve important roles in the tour’s lighting system, which consists of more than 300 fixtures. Ravitz has worked on several tours with The Boss and even won a Primetime Emmy for the band’s HBO special, in addition to winning eight regional Emmy awards for his work on a variety of concerts and televised events. In recent years, Ravitz has worked on concerts ranging from the Coachella Valley Music and Arts Festival to a 3D concert feature for Justin Bieber. For The River Tour, Ravitz uses 15 to 20 MAC Viper Profiles to create individualized, lower-profile backlighting for each member of the band. The Martin fixtures provide each musician with their own key light coming from above and behind them. The MAC Viper Profile is a specialized breed of high-output profile luminaire with an exceptional feature set, superior light quality and a highly efficient optical system. It outperforms all market-leading profiles in the 1,200-watt range and can serve as an alternative to several 1,500-watt fixtures. The Viper Profile is not only brighter, it is also a faster and more compact solution. With its 1,000-watt HID source, the Viper consumes less power, making it over 50% more efficient than its 1,200-watt rivals. In addition to the MAC Viper Profiles, Ravitz chose to deploy 20 Martin MAC Auras due to their outstanding quality and compact size which allows them to fit into a tight cavity on a panel at the front of the stage. He’s used Auras on this tour for a couple of years but it marks the first Springsteen tour where Ravitz has used Martin Vipers, and he has been very pleased with their performance. Ravitz is now designing a larger lighting system to support bigger stadium concerts for the European leg of the tour beginning May 14 in Barcelona. Further supported by MAC Auras and MAC Viper Profiles, the band kicked off a European leg of the tour in Spain in mid-May that will continue throughout Europe this summer.